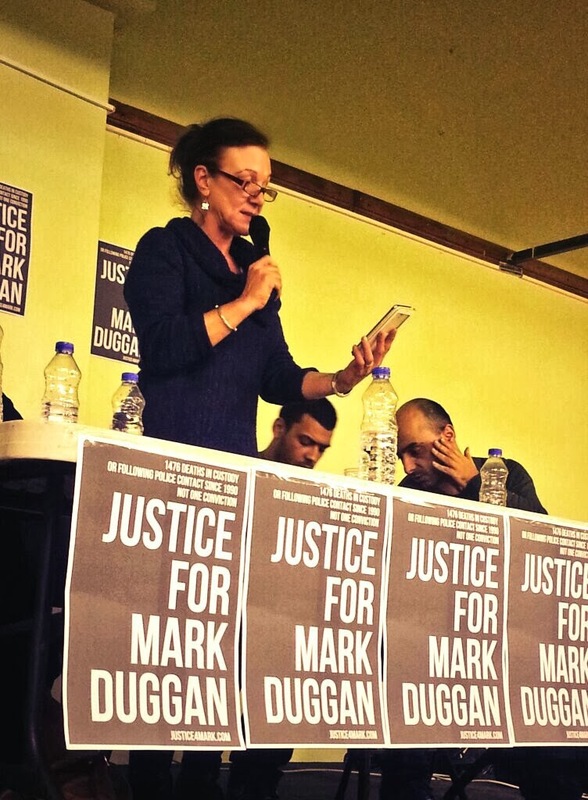 The Justice for Mark Duggan campaign launched in public last night at the North London Community House in Tottenham. 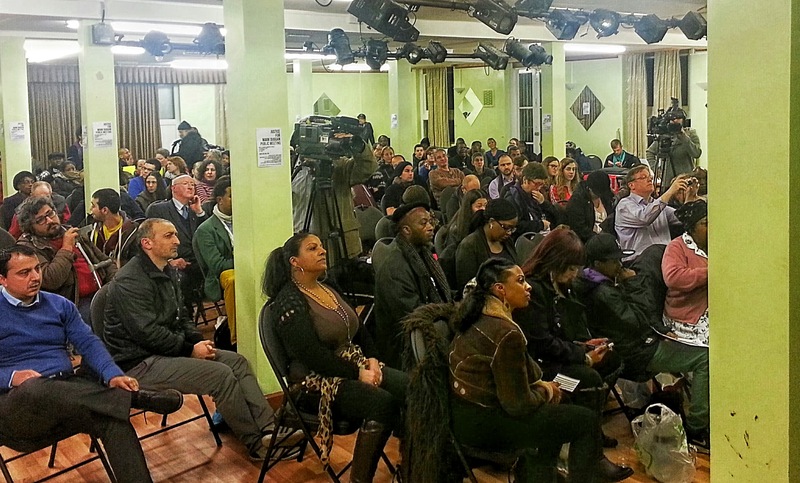 Up to 200 people attended through the course of the evening and heard about the struggle to uncover the truth about Mark Duggan’s murder. Speakers included Carole Duggan, acclaimed poet Linton Kwesi Johnson and video activist Fidel Santigi of Riot From Wrong. All spoke about the long history of lies, cover-ups and media distortions associated with cases of death in custody or following contact with the police. Mark’s family and friends condemned the media for its failure to critically examine the police narrative in cases of death in custody. Throughout the evening we heard moving words from Mark’s friends, many of whom have suffered further injustices since his death on 4 August 2011. Trade union activists were also there, including Zita Holbourne from the PCS, Glenroy Watson from the RMT and Jenny Sutton from the UCU. 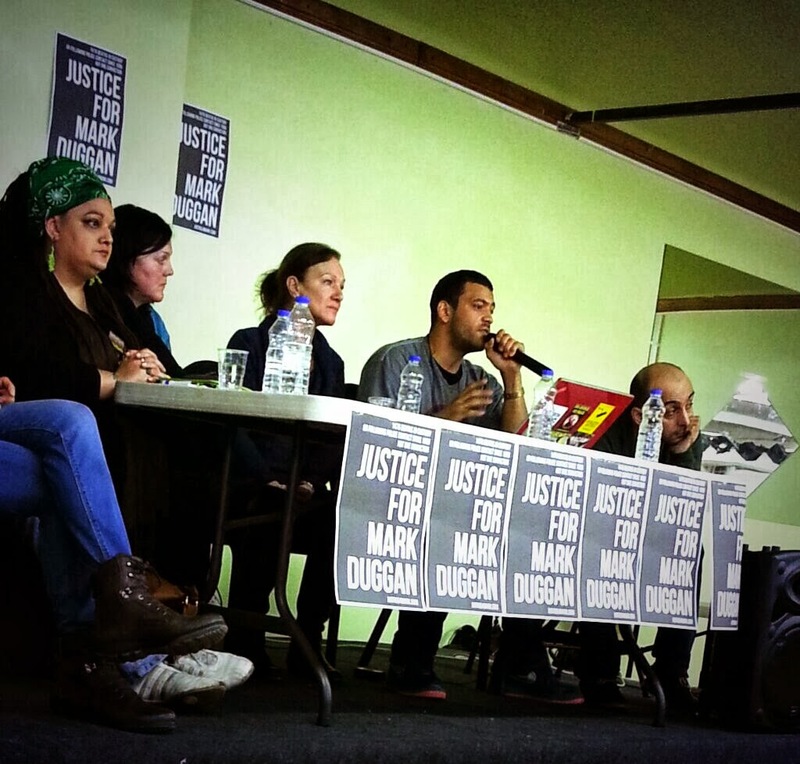 They promised to campaign for solidarity with Justice for Mark Duggan among their fellow workers and in their unions. Diane Abbott MP sent a message of support to the meeting. Speakers from a different backgrounds highlighted the commonalities of their struggles against state violence, racism and austerity. They all underlined the need for solidarity between all those struggles to take them all forward. The meeting took place at a Turkish and Kurdish community centre near Bruce Grove station. Activists from those communities spoke of their experience of police repression, and how they fought it by campaigning based on principles of unity across struggles against the violence of the state. Joy Gardner’s mother Myrna gave a damning account of how determined police and media could be to deny the reality of the racist deaths at the hands of the authorities. Jim Curran from the Irish Civil Rights Association spoke about the experience of the Irish community during the 1970s. Becky Shah from the Hillsborough Justice Campaign gave an emotional account of how insidiously the press conspired with South Yorkshire Police to demonise working class Liverpool fans, beginning their cover-up while bodies were still warm. Marcia Rigg, whose brother Sean Rigg died in police custody in 2008, said that consistent campaigning could win out over bullying from press and police. At the end of last year the Rigg family forced the Independent Police Complaints Commission to reopen a criminal investigation into Sean’s death. Winning justice for Mark will not be easy. The first battle will be to undermine the barrage of myths and lies surrounding who he was and how he died. 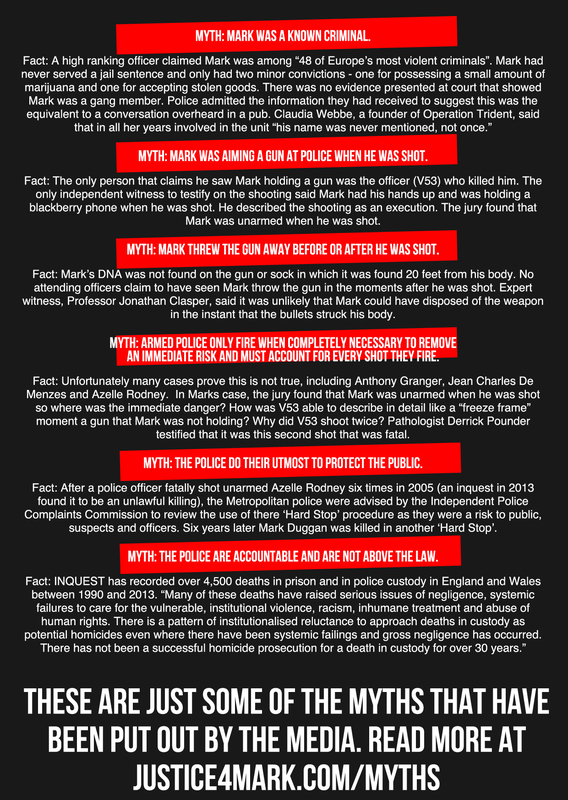 Justice for Mark Duggan has produced a mythbuster card laying out just some of the facts: justice4mark.com/myths. Diane Abbott, MP for Hackney North & Stoke Newington, sent this message to last night’s launch meeting of the Justice for Mark Duggan campaign in Tottenham. My apologies that I cannot be with you this evening. The anger that followed the death of Mark Duggan was a build-up of resentment at persistent negative interactions that the black community face with the police and the justice system, from disproportionate stop-and-search to deaths in police custody. Following Mark’s inquest verdict I held a large public meeting in parliament. The most telling speech meeting was not from one of the many lawyers or experienced activists present: it was from a young woman wearing school uniform who protested at the use of stop-and-search. She said that she and her friends had been harassed by the police since the age of 11. And she wanted to know what could be done. The trust of young people like her are crucial in fighting crime. But instead of viewing the police as her protector she sees the force as her tormentor. As a disadvantaged group black people are more likely to be affected by crime than be the perpetrators of it. But we remain overpoliced as citizens and underpoliced as victims. The inquest verdict has brought serious concerns and justified questions. These should not be framed as some kind of disrespect for the judicial process. The law allows for questions and challenges through appeals and judicial review. If the law itself recognises that it is not always correct, then we have not only a right but a duty ensure that its decisions equate to justice. Let us not forget that had it not been for the Lawrence family challenging a legal ruling – and not only that but leading a campaign to change the law itself – two of Stephen Lawrence’s killers would not have been brought to justice. I stand ready to support Mark Duggan’s family in any way that I can. Myth: Mark was a known criminal. Fact: Mark had never served a jail sentence and only had two minor convictions – one for possessing a small amount of marijuana and one for accepting stolen goods. Myth: Police had evidence Mark was a gang leader. Myth: Mark was aiming a gun at police when he was shot. Fact: The only person that claims he saw Mark holding a gun was the officer (V53) who killed him. Expert witness Professor Derrick Pounder testified that in his opinion officer V53 had probably been wrong to claim Mark had been pointing a gun at him in a threatening manner when he fired the second fatal shot – ballistic evidence indicated he was falling or stooped at the time. An independent witness testified that Mark had his hands up and was holding a BlackBerry phone when he was shot. He described the shooting as an execution. Myth: Mark threw the gun away before or after he was shot. Fact: Expert witness Professor Jonathan Clasper said it was unlikely that Mark could have disposed of the weapon in the instant that the bullets struck his body. No attending officers claim to have seen Mark throw the gun in the moments after he was shot. Mark’s DNA was not found on the gun or sock in which it was found 20 feet from his body. As Mark was unarmed he could have been easily arrested, taken into custody and charged or released. Myth: Armed police only fire when completely necessary to remove an immediate risk and must account for every shot they fire. Fact: Unfortunately we have many cases that prove this is not true, including Anthony Granger, Jean Charles De Menzes and Azelle Rodney. If Mark was a risk to the police, the second fatal shot is still not justified: evidence showed he was falling when it was fired. Why was this second fatal shot fired? But witnesses have testified Mark was unarmed and surrendering which would suggest there was no immediate risk at all. The gun found 20 feet from Mark’s body not only had none of Mark’s DNA on it but was not even clocked in readiness to fire. Yet V53 claims he feared for his life as Mark was pointing this gun at him ready to shoot. Myth: The police do their utmost to protect the public. Fact: After a police officer fatally shot unarmed Azelle Rodney six times in 2005 (an inquest in 2013 found it to be an unlawful killing), the Metropolitan police were advised by the Independent Police Complaints Commission to review the use of their ‘hard stop’ procedures as they were a risk to public, suspects and officers. 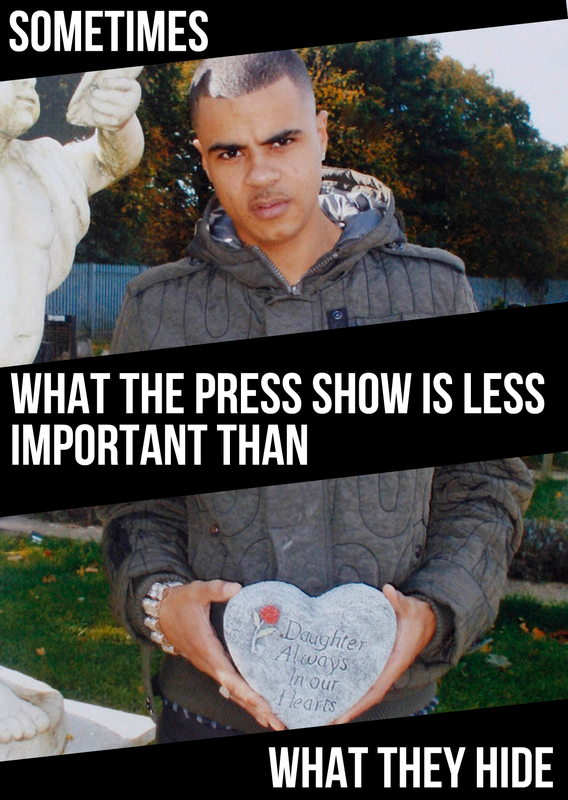 Six years later and an unarmed Mark Duggan was killed in another ‘hard stop’. Myth: The police are accountable and are not above the law. Posted in flyers, media and tagged duggan, flyer, j4m, justice4mark, mythbuster on 30 January 2014 by bat020. 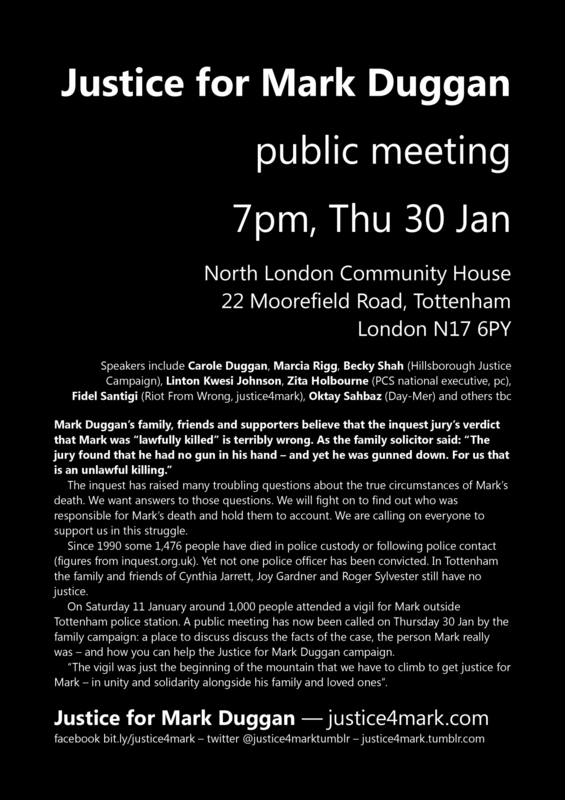 The Justice for Mark Duggan campaign holds its public launch meeting in Tottenham this Thursday evening. 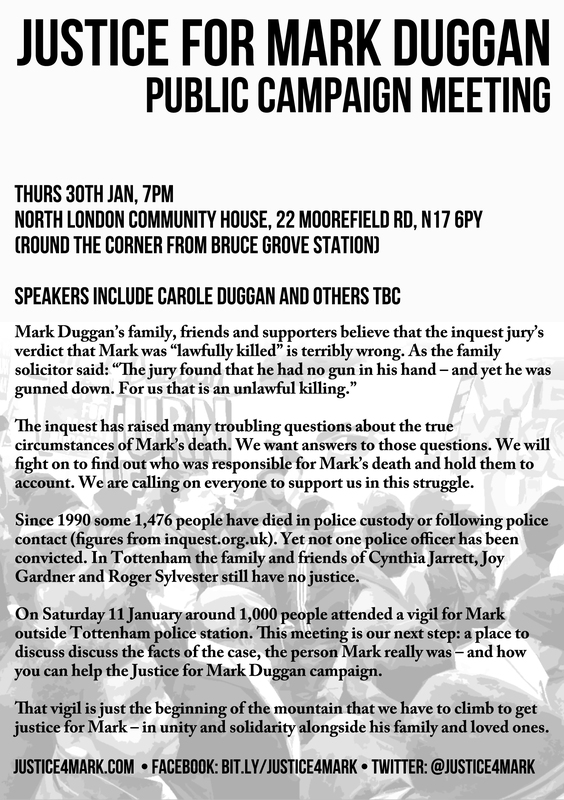 Trade unionists, justice campaigners and Tottenham residents are will join members of Mark’s family to demand answers about the circumstances of Mark’s death at police hands on 4 August 2011. 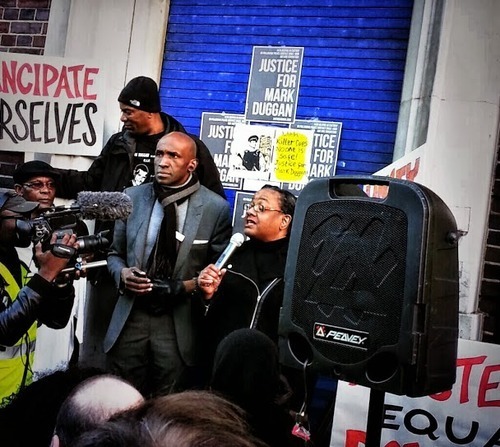 Around 1,000 people came to a recent vigil for Mark organised by the campaign outside Tottenham police station. The public meeting is the next step in an uphill struggle to find out how Mark died and to hold any police officers responsible to account. The meeting will challenge some of the myths and slurs peddled against Mark, including claims by a police officer at the inquest that Mark was among “48 of Europe’s most violent criminals”. Becky Shah, whose mother died at Hillsborough, says: “Police used the same processes to cover up the Hillsborough disaster and Mark Duggan’s death: distorting facts, lies, collusion, stigmatisation and demonisation of victims. We want justice for all those who have died through contact with the police.” Becky will be speaking at the Justice for Mark meeting. The family campaign has already won support from staff at the College of North East London in Tottenham. They recently passed a UCU union motion expressing concern “that the decision to find it lawful for the police to shoot an unarmed person has put all young black people in our college and beyond at risk”. They have pledged to raise these concerns with Tottenham MP David Lammy. Acclaimed poet Linton Kwesi Johnson will also be making an appearance at the launch of Justice for Mark Duggan. Linton’s poems include Licence Fi Kill, about deaths in police custody. Posted in events, press releases and tagged j4m, justice4mark, launch meeting, press release on 30 January 2014 by bat020. Speakers include Carole Duggan, Marcia Rigg, Becky Shah (Hillsborough Justice Campaign), Linton Kwesi Johnson, Zita Holbourne (PCS national executive, pc), Fidel Santigi (Riot From Wrong, justice4mark), Oktay Sahbaz (Day-Mer) and others tbc. The inquest has raised many troubling questions about the true circumstances of Mark’s death. We want answers to those questions. We will fight on to find out who was responsible for Mark’s death and hold them to account. We are calling on everyone to support us in this struggle. Since 1990 some 1,476 people have died in police custody or following police contact (figures from inquest.org.uk). Yet not one police officer has been convicted. In Tottenham the family and friends of Cynthia Jarrett, Joy Gardner and Roger Sylvester still have no justice. On Saturday 11 January around 1,000 people attended a vigil for Mark outside Tottenham police station. 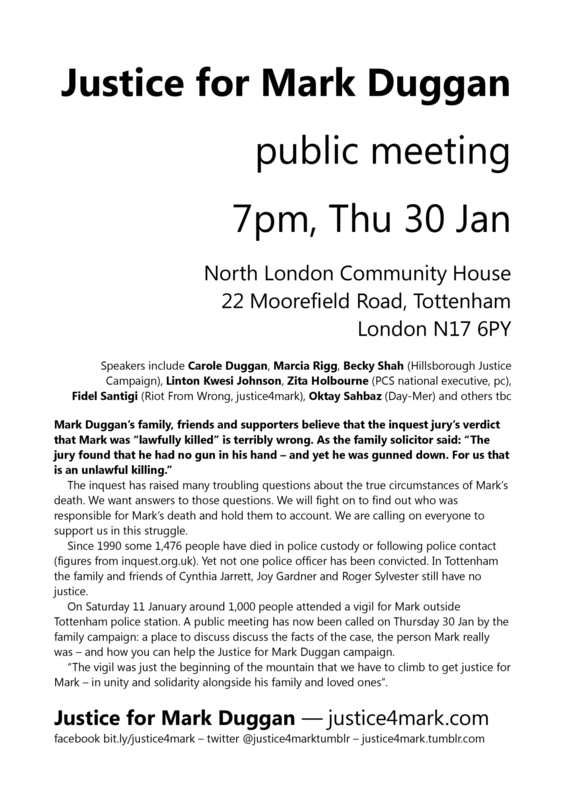 A public meeting has now been called on Thursday 30 Jan by the family campaign: a place to discuss discuss the facts of the case, the person Mark really was – and how you can help the Justice for Mark Duggan campaign. “The vigil was just the beginning of the mountain that we have to climb to get justice for Mark – in unity and solidarity alongside his family and loved ones”. This motion was passed unanimously at a UCU branch meeting at CONEL College in Tottenham, 15 January 2014. You can download it as a PDF or as a Microsoft Word document. Posted in media, motions and tagged duggan, j4m, justice4mark, motion on 20 January 2014 by bat020. Posted in media and tagged duggan, j4m, justice4mark, mark duggan, petition on 19 January 2014 by bat020. On Saturday 11 January around 1,000 people attended a vigil for Mark outside Tottenham police station. This meeting is our next step: a place to discuss discuss the facts of the case, the person Mark really was – and how you can help the Justice for Mark Duggan campaign. That vigil is just the beginning of the mountain that we have to climb to get justice for Mark – in unity and solidarity alongside his family and loved ones. Posted in events and tagged announcements, j4m, justice4mark, leaflet, meeting, solidarity on 18 January 2014 by bat020. Thank you to everyone who came to the vigil called at short notice yesterday, Saturday 11 January 2014, to the vigil called by Justice for Mark Duggan outside Tottenham police station. We appealed to you to come in peace and unity, and you did that. We face an long uphill battle to win justice for Mark and your support is greatly appreciated. The press are estimating several hundred attended the vigil. We believe it was around 1,000, far more than what we were expecting and in the face of relentless negative briefings from the authorities claiming that there would be trouble. In the event the vigil was dignified and respectful, though not without anger at how Mark has been treated. As I said at the vigil, we were there to remember Mark as he was, not as he has been falsely portrayed in the media. The date of the vigil was 15 years to the day since the death of Roger Sylvester at the hands of Tottenham police. Roger’s father Rupert Sylvester joined the vigil, as did representatives of the Hillsborough Justice Campaign, friends of Leon Briggs who recently died in custody of Bedfordshire police, and Marcia Rigg who announced a new investigation into the 2008 death of her brother Sean at Brixton police station. Stephanie Lightfoot-Bennett, whose twin brother Leon Patterson died in police custody in 1992, spoke on behalf of United Family & Friends Campaign. She held up the names of all those who have died in custody since 1969, quoting Martin Luther King. The vigil ended around 3:30pm with words from local pastor Reverend Nims Obunge and Hackney MP Diane Abbott. The vigil closed with us releasing doves to remember Mark and promise to do right by him. Pamela, Mark’s mother, thanked everyone for coming. “We want justice for my son,” she said.